I purchased this vintage folding chair recently at a consignment shop for $7. I gave it a couple of coats of Annie Sloan Chalk Paint in "Old White". After distressing the chair, I added the top and bottom lines of a Bingo Card stencil from Funky Junk Interiors "Old Sign STENCILS". 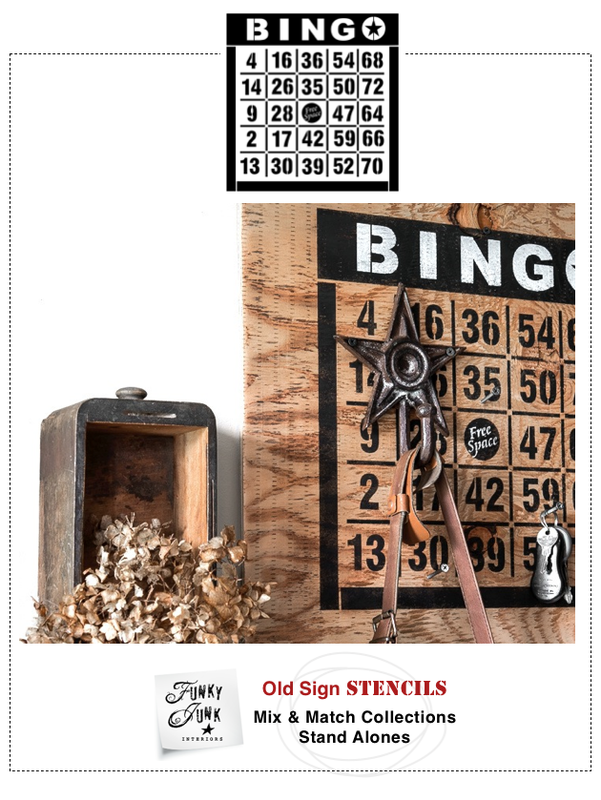 Click HERE to see all of Donna's fun, rustic and funky old sign stencils! I stenciled the top "Bingo" lettering and the bottom row of numbers on the stencil to add some interest to this little folding chair. I used a dark gray acrylic paint for the number stencils. I distressed the letters and numbers with sandpaper, and finished the chair with an application of clear wax. Besides the obvious signs, the design possibilities with these stencils are endless! This chair is just one idea! What a clever and creative way to use the BINGO stencil. Love it!! What a great redo.........love it! love it. gave me an idea for some old chairs I have. will stencil 'garden' across back. Love the chair makeover!! Gotting to check out Donna's stencils. How absolutely adorable is this chair design?! So unexpected!